The above info came from Amanda Benhma, and was edited by yours truly (contact me). After a suicide committied by Chisa Yomoda, strange e-mails have been received by people suggesting that they came from her. Lain Iwakura, age 13, gets this strange e-mail, then soon is drawn close into the world of the Wired (also known as the internet). Soon her Navi is upgraded, and strange things start happening to her. She soon discovers there is another her, in the wired, and she goes about trying to find out who she is. The above description came from Amanda Benhma, and was edited by yours truly (contact me). In a world where technology is growing more and more advanced, Lain Iwakura was a girl with no experience. However, all of this changes when one of Lain's classmates mysteriously commits suicide. 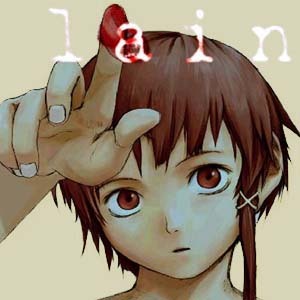 Lain decides to get her own computer and link to the Wired (the advanced internet of the Lain universe). Things get even stranger when her classmate e-mails Lain... after she dies. From then on, Lain sinks deeper and deeper into the Wired and Lain transforms into something other than herself. She becomes a celebrity of the Wired, and even grows new and shocking personas. But what is the Wired, and how is it influencing everything in reality? The mysteries and questions grow even more complex, even to the point where Lain might not even know who she is.